For the final day of Pull apart bread, I made a Cinnamon Pull Apart Loaf stuffed with Caramelized Apple and glazed with Cream Glaze. I know the name is so long. However, the loaf disappeared before I could even think properly. I guess kids thought it was a ritual to bake a cake or a bread during Sunday afternoon so that they have some Tea time snacks ready. This has been happening the last couple of weekends and they sort of expected it. So I had to deliver the goods! In a wide bowl, take all the ingredients except water and mix well. 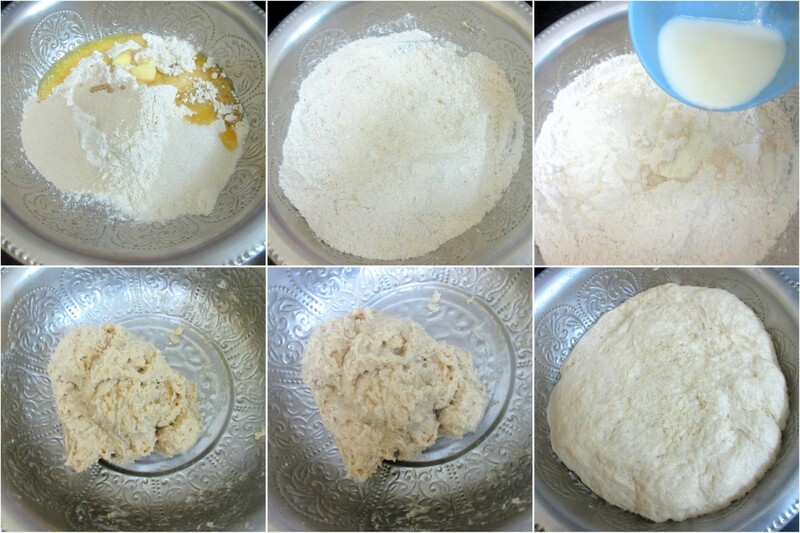 Depending on the softness of the dough add water to knead into a pliable dough. Cover and let it rise for over 1.5 hrs or 2 hrs. Mine was done before 2 hrs. Wash, peel and dice the apples into small pieces. 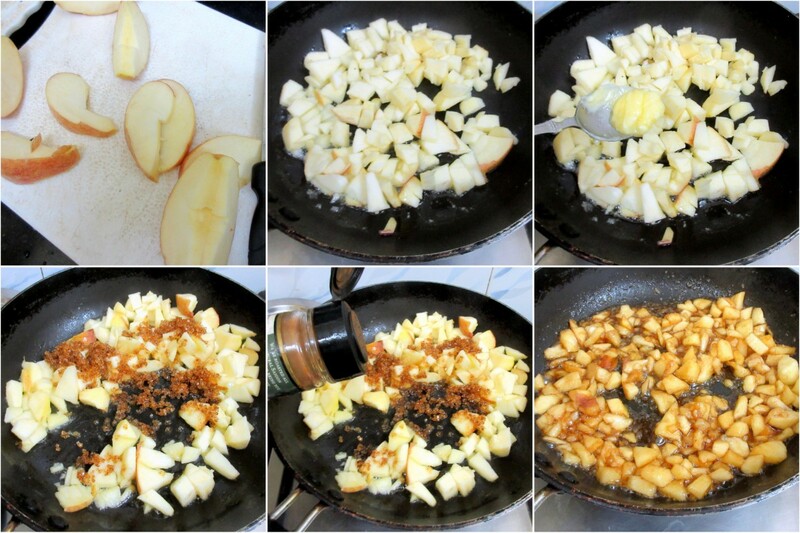 Heat a nonstick pan with butter, add the apple pieces, cook well for 2 mins.Then add the brown sugar and simmer till the apple is well coated and caramelized. Sprinkle the cinnamon powder over it. Keep it aside. 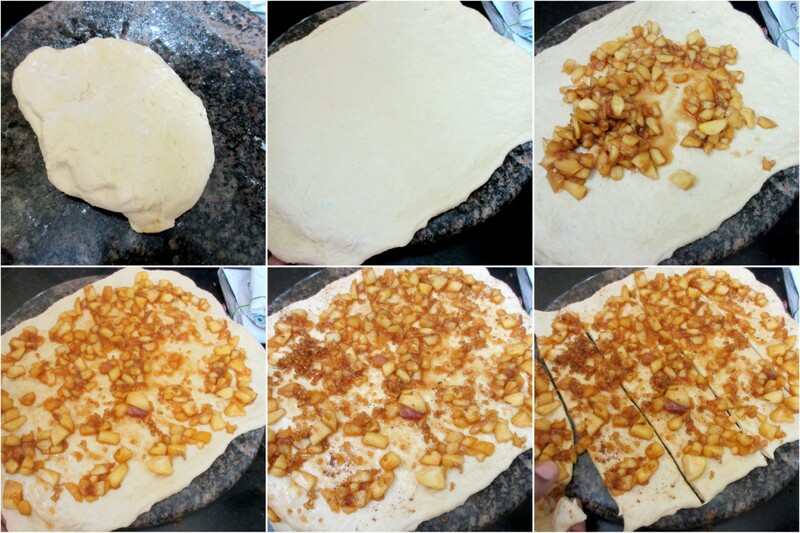 Divide the dough into two equal balls. 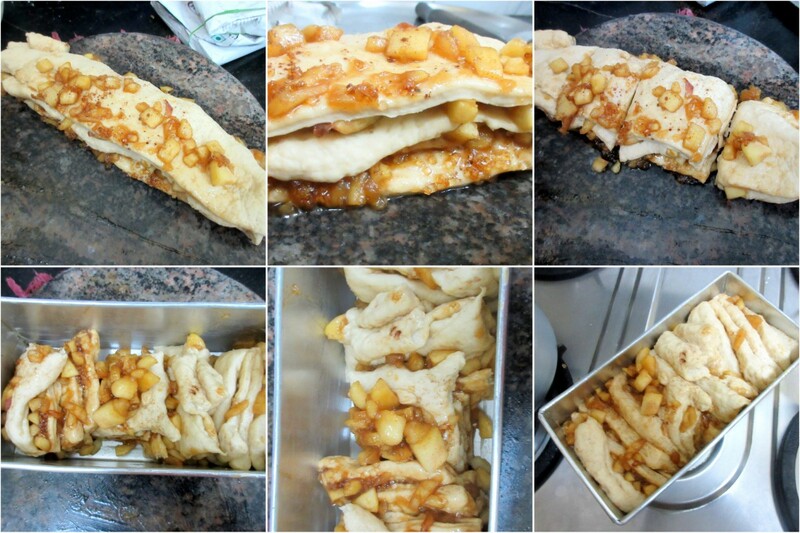 Roll out well and spread the apple mix on the top. Using a pizza cutter cut into 3-inch pieces. Place each layer over each other. Finally, cut the layered slice into 4-inch pieces. Stack the layers in the prepared loaf as shown in the picture. Repeat the same for the second loaf, and let it rise for the second raise. It took about 30 mins for the second rise. Preheat the oven to 195 C and bake for 20 mins. Baking time might differ based on ovens. Mine got done in 18 mins. Apple and cinnamon is such a wonderful flavor , nothing can ever go wrong with it . Super ! Sinfully delicsious ! 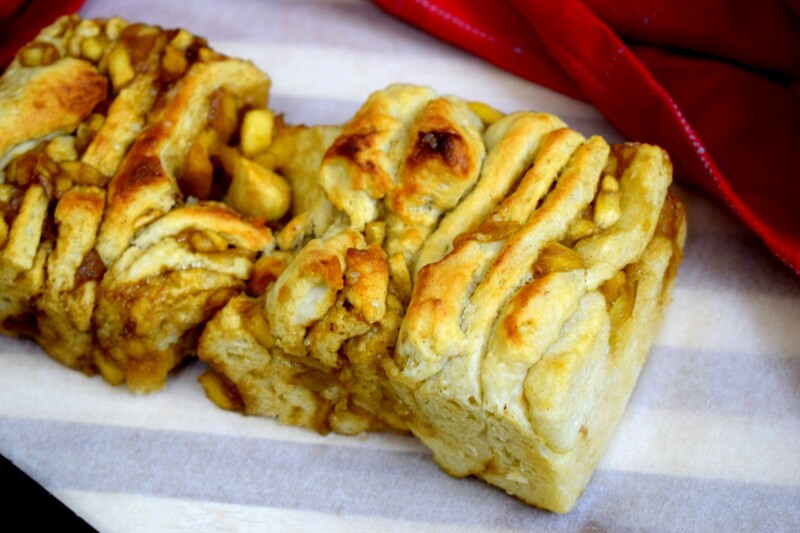 apple and cinnamon are a great combo..
Apple and cinnamon bread looks wonderful. Great dessert idea!! Wow you got another classic combination here! 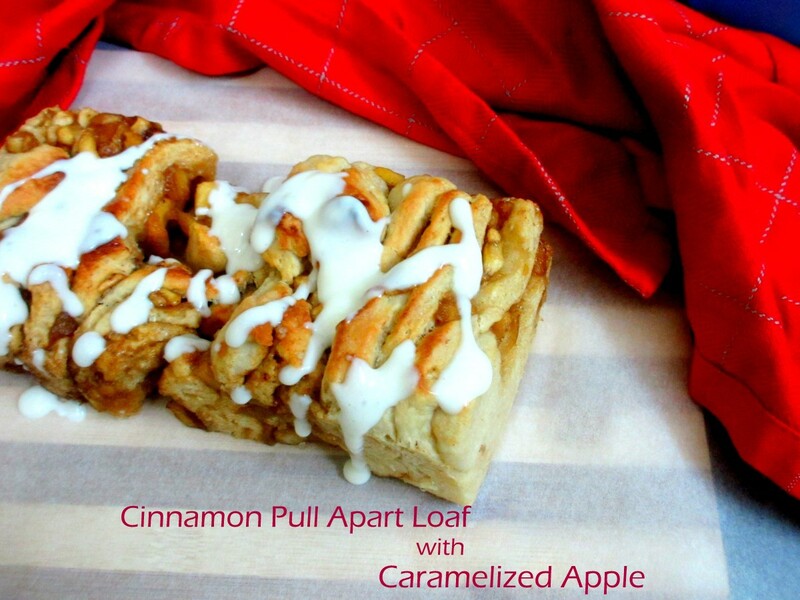 Cinnamon and apple in a bread sounds almost like an apple pie! Loved it. OMG what a drool worthy bread this is Valli. Love the caramel apple stuffing — yumm yumm!! 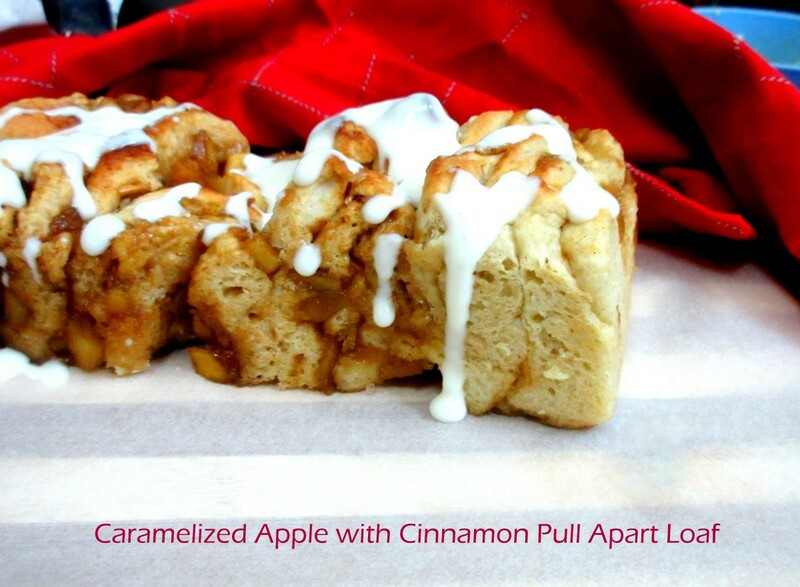 Just want to pull and enjoy this fantastic cinnamon pull apart bread, irresistible combo. Aloo Tamatar Sabzi with Kasturi Methi!